Merry Christmas and the Happiest of Every Holiday to You! You have guided our kids and Club to a rewarding and thankful Season. We are truly blessed by your friendship and thoughtfulness. 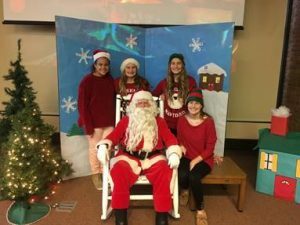 Our 2nd Annual Santa for Girls & Boys event was supported by volunteers from Girls Scouts, Mooresville Public Library, our Board of Directors, and Friends of the Boys & Girls Club. Your volunteerism served 200 kids, giving them a great and traditional holiday memory! Thank you for your Magic Santa and Mrs. Claus! The Mooresville Consolidated School Corporation is always there for our kids and community! 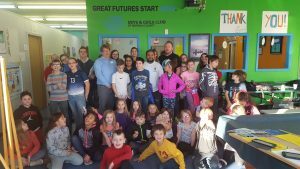 Our partnership through the Indiana Department of Education 21st Century Community Learning Centers empowers families from every public school in Mooresville with the opportunity to benefit from Boys & Girls Club programs and services. The Champions of Character from Mooresville High School volunteer after school every day at the Club. 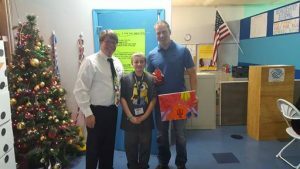 This year they also provided a holiday party complete with gifts for our new cooking program and treats! You cannot be thanked enough for your example of good character and service. Youth Connections is a great new friend. As one of our program partners, Youth Connections provides science and robotics classes every week at the Club. They are also developing our own Robotics Competition Team! 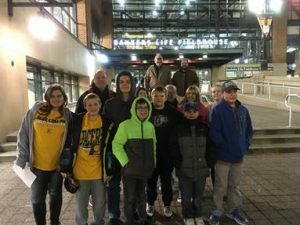 For a special experience, Youth Connections took our middle schoolers to Bankers Life Field House to see the Pacers play the Detroit Pistons. Mentoring kids and guiding them toward new interests and skills changes lives! Thank you, ALL, for partnering in every way that you do with the Boys & Girls Club. Our Board and Staff shared our Annual Meeting with Friends of the Club. Kudos to our Board for being the hardest working volunteer board in Morgan County! You grew the size of our board by 50% and developed many important community relationships to sustain our operations. Club Member, Broden presented Mr. B. J. Pendill with our Torch Bearer Award, The West Family earned our Volunteer Family of the Year honors, and Michael Wood earned our Mentor of the Year recognition. You are changing lives! Please know how special and impactful your involvement is with the Boys & Girls Club. You provide our kids with the guidance, example, and support that they need to grow and earn their intended role in our community. Thank you to our 100 Business Who Care Giving Society for having big hearts for our kids! Sam Reuter of Painter Pro donated a fresh coat of paint throughout the Club! Thank you everyone for blessing the Club with your gifts of time, expertise, and resource. Wishing you every blessing at Christmas and always, & a 2018 filled with health and prosperity. P.S. 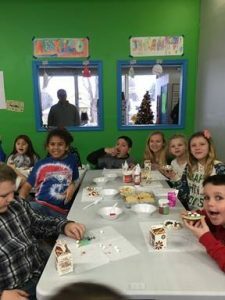 The cost to families is $20 per child ( $10 for siblings) to attend the Club for a whole year, but it costs us roughly $600 per child to provide Club programs and services. Any support you share helps us fill the gap and reach more children each year. Thank you!